Arthur C Clarke Institute in Sri Lanka: Time to ask some tough questions! For many years, I’ve been explaining and clarifying to everyone that I worked with the late Sir Arthur C Clarke in his personal office in Colombo, which was completely separate from a government entity named the Arthur C Clarke Institute for Modern Technologies in Moratuwa, Sri Lanka. This is not just an institutional demarcation; the latter body set up by the government of Sri Lanka in 1984 and sustained since then with public funding has completely under-served its founding ideals and remains mediocre and unproductive after a quarter century. I have no wish to be associated, even mistakenly, with such an entity. I remained quiet about this for as long as Sir Arthur was alive, as it was not tactful for me – as part of his team – to criticise a state entity named in his honour. A year after his death, I broke that silence and wrote a media article which was published in the current affairs magazine Montage in April 2009. That elicited some strange ‘reader comments’ on the magazine’s website — several of which alleged that I was a ‘traitor’ who was out to discredit the hard-working (‘Sinhala Buddhist’) engineers and managers of this institute! I could not fathom how and why the staff’s ethnicity or religious faith was relevant. Beyond such vitriol, these pseudonymous ‘readers’ never once responded to my specific questions about the public-funded institute’s scientific productivity and public accountability. As always, this blog is open to a rational discussion of the core issues raised below, as all the concerns still remain valid. And there are no ‘sacred cows’ in my book! 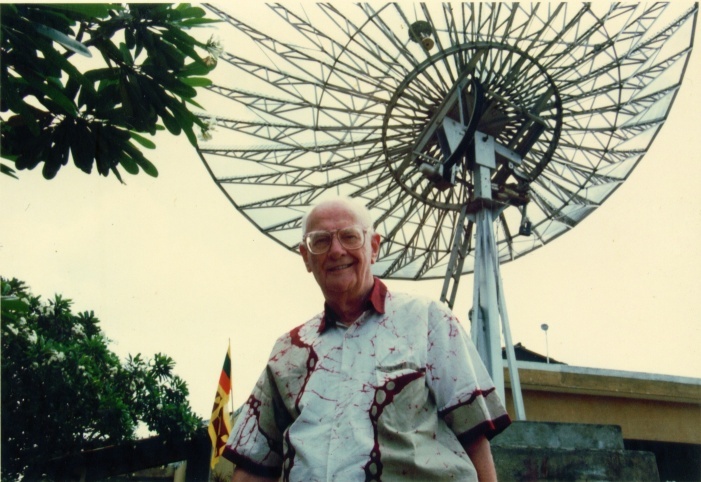 As the first death anniversary of Sir Arthur C Clarke approaches, Lankans are still debating how best to cherish the memory of the celebrated author and visionary who called the island his home for more than half a century. Ours is a land where private individuals — and governments –- just love to put up ostentatious and often superfluous structures to honour the departed. We typically don’t assess their cost-effectiveness or utility. Neither do we pause to ask how the person being honoured would have felt about it. The Telecommunications Regulatory Commission of Sri Lanka (TRCSL) recently announced plans to launch the country’s first satellite, which is to be named after Sir Arthur. According to news reports, it will be launched into low earth orbit (LEO) at an estimated cost around US$ 20 million. Would naming Sri Lanka’s first satellite be a fitting tribute to Sir Arthur, universally acclaimed as inventor of the communications satellite (comsat)? Or should a monument to this ‘one man cheering squad for Sri Lanka’ be more rooted in the Lankan soil, where people can see and feel its presence everyday? And, by the way, what about the state technical institute in Moratuwa that already bears the Arthur Clarke name? Sir Arthur, with whom I worked closely for 21 years as an aide and a decade as spokesman, would surely have wanted an open and frank debate on this matter. He opted for rational, evidence-based decisions based on cost-benefit analysis. He frowned upon grandiose plans made for their own sake, whether their implementation was going be paid for by public or private funds. Besides, he already had an asteroid, dinosaur species and a geostationary comsat named after him during his lifetime. Topping that without going over the top would be a challenge indeed. The tussle for the Clarke legacy started within hours of his death on 19 March 2008. He had left clear written instructions for his funeral to be held on a strictly secular and austere basis. He didn’t want any decorations, and explicitly disallowed official involvement by British or Lankan governments. As this news spread, it fell on me to explain to government officials why offers of a state funeral and other types of state patronage could not be accommodated. This raised some eyebrows and dashed hopes of some who wanted to turn the sombre event into a carnival. In the end, the state appealed for a symbolic radio silence of two minutes to coincide with the funeral. In the weeks and months that followed, many have asked me what kind of monument was being planned in Sir Arthur’s memory. The answer, as far as the Arthur Clarke Estate is concerned, is none –- and this seems to surprise many. That evokes memories of the well known epitaph for Sir Christopher Wren, one of the greatest architects of all time, who significantly changed London’s skyline: “Lector, Si Monumentum Requiris Circumspice”(“Reader, if you seek his monument, look around”). It also begs the question why Sir Arthur chose not to make any mention of the physical entity that already bore his name: the Arthur C Clarke Institute for Modern Technologies (ACCIMT). Indeed, the ACCIMT is today a perfect example of a good idea gone astray, becoming a disgrace to the very man it was meant to honour. How did things go wrong to the point where Sir Arthur Clarke distanced himself from the Arthur Clarke Institute in the last few years of his life? These thorny questions need to be asked now that we are discussing matters of legacy. 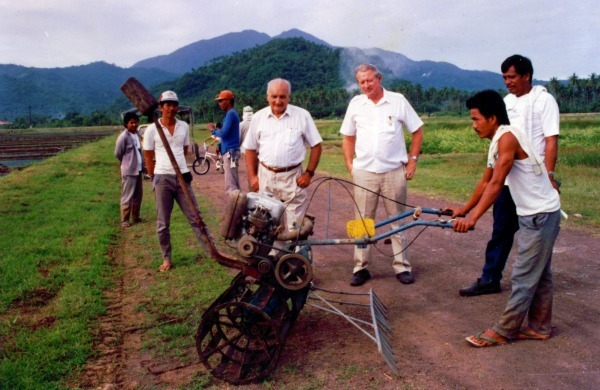 The world was very different, and aspirations were very high, when ACCIMT was established in 1984 by an Act of Parliament to help transfer and adopt modern technologies in five areas: computers, telecommunications, energy, robotics and space technology. The Institute, initially called the Arthur Clarke Centre, was to undertake research and development as well as train technical professionals in ways that would accelerate economic development and advance the quality of life. Several leading Lankan professionals were associated with its creation. Among them were civil servant (later Minister) Dr Sarath Amunugama and diplomat (now academic) Dr Naren Chitty. In 1985, President J R Jayewardene appointed the eminent biochemist (and his science advisor) Professor Cyril Ponnamperuma as its founder director. As patron, Sir Arthur had no executive functions or responsibilities, but generously provided advice, guidance and some funding to the fledgling institute. He donated US$ 35,000 received for the 1982 Marconi Fellowship. Just as importantly, he mobilised his far-flung network of international contacts in scientific, technological and engineering circles. The Arthur Clarke ‘fan club’ stretched far and wide -– from the White House to the Kremlin, and from elite academia to geeky Silicon Valley. Carrying this unique calling card, ACCIMT had access to a global reservoir of goodwill, partnerships and external funding. Tragically, despite this head start and advantages, the Institute reaped little benefit. While it did show some early promise, it has failed to consolidate itself as a credible and productive technical institute. Its founding aim of becoming a centre of excellence for the developing world also flopped. When assessed using universally accepted measures of scientific productivity -– such as research publications in refereed international journals, peer citations and patents for innovation — it shows a dismally poor track record. For sure, it has been dabbling with a few everyday technologies such as traffic lights, telephone locks and domestic gas leak alarms. Useful as these applications are in specific situations, they cannot justify 25 years of substantial investment of Lankan tax payer money as well as international donor funds. Perhaps an institute with this kind of lofty mandate could have been more influential at the apex policy level. The past 25 years have seen Sri Lanka adopting many new information and communication technologies or ICTs (e.g. mobile telephony in 1989, commercial internet connectivity in 1995). There has been an unprecedented and phenomenal growth in the coverage of telecom services. These developments have thrown up many policy and regulatory challenges for the state and private sector players. Alas, ACCIMT has not kept up with the rapid evolution of information society, and failed to carve out a clear niche for itself even as Sri Lanka engages the Global Village through a multitude of ICTs. Its voice is neither heard nor heeded in key debates on bridging the digital divide, and on how best to prepare our youth to ‘exploit the inevitable’ in a globalised marketplace. These concerns were very dear to Sir Arthur, who continued to talk and write perceptively about them to the very end of his life. But ACCIMT is still stuck in the obsolete analog concerns of the 1980s. Peer acceptance and recognition are indicators of any technical institute’s standing. ACCIMT would struggle to demonstrate its worth on these criteria. It is routinely bypassed by state policy making mechanisms and agencies. It is curious how the telecom industry regulator is spearheading the government’s newly announced satellite project. Why is ACCIMT, with a statutory mandate in this subject, not playing a more prominent role in such plans and discussions? When the rest of government ignores the institute, it’s not surprising that technology-based industries don’t turn to it for advice either. The institute’s principal activity these days is conducting training courses in electronics — useful, no doubt, but for which purpose there already are several dedicated vocational training centres. For much of its 25 years, the Arthur Clarke institute has taken cover behind its famous patron to avoid adequate public scrutiny. Large sections of society, including many in the media, harboured a misconception that Sir Arthur Clarke was personally involved in its management and research; in practice, he had none. Things didn’t always look this bleak. For a while, it seemed as if the institute would live up to its founders’ expectations. For example, it was the first to downlink and relay CNN broadcasts in Sri Lanka. CNN founder Ted Turner‘s respect for Sir Arthur made this possible. The institute was also involved designing low-cost dish antennae for households to directly capture satellite TV transmissions in the 1980s when only two terrestrial channels were available. March of technology and commerce later made these services redundant. One far-sighted activity that Professor Ponnamperuma started was the Science for Youth programme. On a national and competitive basis, 25 of the brightest high school leavers were selected and introduced to modern technologies over six consecutive weekends. Out of that exercise eventually emerged the Young Astronomers’ Association and Computer Society of Sri Lanka, the latter now a professional body. As part of the 1986 batch, I can personally vouch for the insights and inspiration Science for Youth gave me in those pre-Internet days. 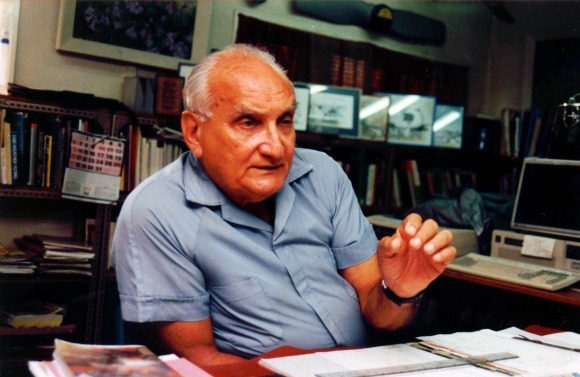 I was especially fascinated by the outspoken views of inventor and aviator Ray Wijewardene. The friendship I formed with him has lasted for over two decades and enriched me enormously. Later, as a young science journalist, I used to cover the institute’s public events hosting of visiting tech pioneers and Russian cosmonauts. For a while, ACCIMT was a ‘happening place’. Then, sometime in the 1990s, the institute abandoned most of its public engagement and outreach activities. This inward looking attitude didn’t change even after the government decided to locate the country’s largest optical telescope (donated by Japan) at the institute. I remember how exasperated Sir Arthur was to hear schools being told that they may visit and look at the telescope during the working hours from 9 am to 5 pm! But by then, he was not going to intervene. After he turned 80 in 1997, Sir Arthur adopted a policy of ‘benign neglect’ towards the institute on which he had pinned such high hopes only years earlier. Ever conscious of his ‘resident guest’ status, he chose not to criticise the institute in public, although he shared his dismay and disappointment in private. As we debate how best to preserve Sir Arthur’s illustrious legacy, we cannot afford to continue such ‘benign neglect’ on the publicly-funded Arthur Clarke Institute. A good starting point would be to belatedly ask tough questions and engage in some serious introspection. Sir Arthur would have expected nothing less. About the writer: Science writer Nalaka Gunawardene worked for Sir Arthur Clarke’s personal office, which was totally separate from the Arthur Clarke Institute. The views in this article are entirely those of the author. Photographs courtesy Rohan de Silva, Arthur C Clarke Estate. FINALLY, SOME HOPE OF SALVAGING ARTHUR C CLARKE’S LEGACY — ON THE OTHER SIDE OF THE PLANET! My weekly column on science, development and media, published in Ravaya newspaper on 28 August 2011 (converted into unicode Sinhala font using UCSC online facility, which has some limitations). ආචාර්ය රේ විෙජ්වර්ධනගේ චින්තනයෙන් හා වසර 86ක ජීවිතයෙන් අපට උගත හැකි පාඩම් රැසක් තිඛෙනවා. එයින් කිහිපයක් ගිය සතියේ සදහන් කළා. අද අපි නැවතත් ඒ ‘සරු කෙතට’ පිවිසෙනවා. ‘කෘෂිකර්මාන්තය’ ලෙසින් ගරු ගාම්භීර විධියට හ`දුන්වන ගොවිතැන් කිරීම ගැන රේ විෙජ්වර්ධනට තිබුණේ සැබෑ උනන්දුවක්. එහෙත් ඔහු ගොවිතැන් කිරීම දැක්කේ විද්‍යාඥයන් හා ප්‍රතිපත්ති සම්පාදකයන් දකින කෝනයෙන් නොවෙයි. අනියත කාලගුණ තත්ත්වයන් හමුවේ මහපොළවත් සමග නිරතුරුව ගනුදෙනු කරමින් ආහාර හා වෙනත් බෝග වවන කුඩා පරිමානයේ ගොවීන් ගැන බැතිබර ලෙන්ගතුකමක් ඔහුට තිබුණා. කුඩා ගොවීන්ගේ ප්‍රශ්න හදුනාගන්නට නම් ඔවුන් සමග වෙලට හා හේනට බැසිය යුතු බව ඔහු විශ්වාස කළා. ඝර්ම කලාපීය (tropical) රටවල ගොවිතැන් කිරීමේදීත්, සමශීතෝෂණ (temperate) රටවල ගොවිතැන් කිරීමේදීත් ප්‍රබල වෙනස්කම් තිඛෙන බව ඔහු කියා සිටියා. ඝර්ම කලාපයේ අපේ වැනි රටවල මුළු වසර පුරා හිරු එළිය ලැඛෙනවා. එහෙත් සමශීතෝෂණ කලාපීය රටවල හිරුඑළිය හරිහැටි ලැඛෙන්නේ ගිම්හානයේ දී පමණයි. මේ නිසා සාපේක‍ෂව ඉක්මනින් හිරු එළිය ආහාර බවට පත් කළ හැකි කෙටි කාලීන බෝග වගාව ඒ රටවලට වඩාත් උචිතයි. ඇත්තට ම වී ශාකයත් සමශීතෝෂණ දේශගුණය ඇති චීනය වැනි රටවලින් ඇරඹී ඉන්දියාව හරහා අපට ලැබුණු දායාදයක්. එසේ වූව ද කාලයාගේ ඇවෑමෙන් ඝර්ම කලාපීය රටවල ජනයා වී ගොවිතැනට හොදහැටි හුරු වී ඇති බව ඔහු පෙන්වා දුන්නා. ඓතිහාසිකව අපේ මුතුන් මිත්තන්ගේ ප්‍රධාන ආහාරය බත් පමණක් නොව කොස්, දෙල් හා විවිධ අලවර්ග වූ බවත්, ඒ සමහරක් බහුවාර්ෂික බෝග වසර පුරා ම හිරු එළිය උකහාගනිමින් ආහාර නිපදවිය හැකි ඝර්ම කලාපීය දේශගුණයට මනා සේ ගැලපෙන බවත් ඔහු කියා සිටියා. ඝර්ම කලාපීය ගොවීන්ට තිඛෙන ප්‍රධානතම අභියෝග දෙක නම් පසේ සරු බව රැක ගැනීම සහ ගොවිබිමේ වල් පැළෑටි පාලනය කිරීම. මේ අභියෝග දෙක ගැන දැඩි අවධානය යොමු කරමින් ඔහු වසර ගණනාවක් විවිධ අත්හදා බැලීම් කළා. ඝර්ම කලාපීය වනාන්තරවල මේ සාධක දෙක සොබාදහම ඉතා කාර්යක‍ෂම අයුරින් තුලනය කර ගන්නා සැටි අධ්‍යයනය කළ රේ, වනාන්තර අනුකරණය කිරීම ගොවිබිමට ගැලපෙන සැටි පෙන්වා දුන්නා. ඝර්ම කලාපීය රටවල කිසිම අවස්ථාවක පසේ (වඩාත් ම සාරවත්) මතු පිට තට්ටුව නිරාවරණය වන්නට ඉඩ නොතැබිය යුතු බව ඔහු අවධාරණයෙන් කියා සිටියා. එසේ වූව හොත් අධික හිරුඑළියෙන් පස දූවිලි බවට පත්විය හැකි අතර, වර්ෂාව නිසා ඉක්මනින් සෝදා පාලූවට ලක්වීමට ද හැකියි. මේ තත්ත්වයන් වළක්වා ගන්නට ගොවිබිම්වල කුඩා පදුරු මෙන් ම තැනින් තැන ලොකු ගස් ද වැවිය යුතුයි. මේ ගස්වලින් ගිලිහී වැටෙන කොළ රොඩු වැස්ම නිසා පස ආරක‍ෂා වනවා. එමෙන් ම වල් පැළෑටි බිහිවීම ද වළක්වනවා. දේශගුණික හා කාලගුණික සාධක ඛෙහෙවින් වෙනස් වූ සමශීතෝෂණ රටවල ගොවිතැන් කිරීම සදහා මුළු ගොවිබිම් යාය ම එළිපෙහෙළි කරනවා. එය ඔවුන්ට ගැලපෙන නමුත් ඝර්ම කලාපයේ අපට ඉතා අහිතකර බවත්, මේ වෙනස හදුනා නොගෙන ඒ ආකාරයේ විවෘත ගොවි බිම් අපේ රටේ ද ඇති කිරීමෙන් අපේ සරු පස විශාල වශයෙන් සෝදා පාළුවට ලක් වූ බවත් රේ පෙන්වා දුන්නා. සමශීතෝපණ රටවලින් කෘෂිකර්ම පශ්චාත් උපාධි ලබා අපේ ඝර්ම කලාපීය රටේ කෘෂිකර්ම ප්‍රතිපත්ති හදන හා පර්යේෂණ කරන බොහෝ විශේෂඥයන්ට මේ තිත්ත ඇත්ත දිරවා ගන්නට අමාරු වුණා. එයින් නොසැලූණු රේ මේ සංකල්ප ප්‍රායෝගිකව අපේ ගොවීන්ට හ`දුන්වා දෙන්නට වෙහෙස ගත්තා. 1970 දශකයේ වැඩි කාලයක් ඔහු ගත කළේ අපි්‍රකාවේ රටවල කෘෂිකර්ම උපදේශකයකු හැටියටයි. ඒ කාලයේ ලැබූ අත්දැකීම් හා කළ පර්යේෂණ පදනම් කර ගෙන ඔහු බෑවුම් කදුකර ප්‍රදේශවලට වඩාත් උචිත වගා ක්‍රමයක් හැටියට Sloping Agricultural Land Technology (SALT) ලංකාවේ ප්‍රවර්ධනය කළා. SALT 1970 දශකයේ පිලිපීනයෙන් ඇරඹුණු ක්‍රමවේදයක්. ඉතා ම සරලව කිවහොත ඉක්මනින් වැවෙන රනිල ශාක (leguminous plants) සමෝච්ච රේඛා පදනමට බෑවුම්වල වවනවා. වායුගෝලයෙන් නයිට්‍රජන් උකහා ගෙන පසේ ගැටිත‘ බවට පත් කිරීමේ හැකියාව ඇති එම ගස් පේළි අතර වෙනත් බෝග වගා කළ හැකියි. 1980දී යළිත් ලංකාවට ආ රේ, SALT ක්‍රමය අපේ කදුකරයට ගැලපෙන ලෙස සකස් කිරීමට අත්හදා බැලීම් කළා. ඉක්මනින් වැවෙන රනිල ශාක මෙන් ම දිගු කලක් වැවෙන වෙනත් බහුවාර්ෂික ශාක ද කදු බෑවුම්වල සිටුවීමෙන් වගාවට සෙවනක්, කොළරොඩු දායකත්වයක් මෙන්ම පස සෝදා යාමට එරෙහිව ස්වාභාවික බැම්මක් ද ලැඛෙනවා. රාජ්‍ය කෘෂිකර්ම නිලධාරීවාදය මේ නව අදහස්වලට එතරම් කැමැති නොවූ නිසා ඔහු පෞද්ගලික අංශය සමග ඉදිරියට ගියා. කදුකරයේ ඇතැම් තැන්වල දුම්කොළ වවන කුඩා ගොවීන්ගේ බිම්වල සරු බව රකින්නට SALT ක්‍රමය යොදා ගත්තා. 1989 සිට ඌව පලාතේ දඩයම්පොළ ගම්මානය කේන්ද්‍ර කර ගෙන කළ SALT අත්හදා බැලීම් සාර්ථකවීමත් සමග අවට ප්‍රදේශ රැසක දුම්කොළ ගොවීන් පමණක් නොවෙයි අනෙකුත් එළවළු ගොවීන්ද මේ ක්‍රමවේදයට පෙළඹුණා. ලංකාවේ SALT ක්‍රමය සදහා ග්ලිරිසීඩියා (Gliricidia sepium) නමින් උද්හිද විද්‍යාත්මකව හදුන්වන ශාකය වඩාත් උචිත බව ඔහුගේ නිගමනය වුණා. මේ ශාකය විවිධ නම් වලින් අපේ රටේ හැදින්වෙනවා: ගිනිසිරියා, වැටහිරියා, වැටමාර, ලදප්පා, නාංචි, සෙවන, මකුලතා හා ඇල්බීසියා වශයෙන්. SALT යොදා ගෙන දුම්කොළ ගොවීන් සමග කළ පාංශ= සංරක‍ෂණ කටයුතුවලට ඇගැයීමක් හැටියට 1997දී බි්‍රතාන්‍යයේ වර්ල්ඩ් අවෙයාර් සම්මානය World Aware Award පිරිනමනු ලැබුවා. එහෙත් දුම්කොළ කර්මාන්තයට එරෙහි මෙරට ඇතැම් දෙනා මේ උත්සාහය හෙළා දැක්කා. දුම්කොළ සමාගම සමග හවුලේ උඩරට පාංශ= සංරක‍ෂණයට යොමුවීම ගැන අපේ සමහර පරිසරවේදීන් රේ විෙජ්වර්ධනට දැඩි සේ දෝෂාරෝපණය කළා. ටික කලකට පසු ක`දුකර තේ වතුවලට ද SALT ක්‍රමය හදුන්වා දුන්නා. අද වන විට ලංකාවේ මෙන් ම ඉන්දියාවේ තේ වතුවලත් මේ ක්‍රමය ක්‍රියාත්මක වනවා. ලංකා තේ පර්යේෂණ මණ්ඩලයේ සභාපතිවරයා හැටියට වසර කිහිපයක් කටයුතු කළ රේ වැඩි අවධානයක් යොමු කළේ උඩරට කදුකර පරිසරයට හානි නොකර අපේ තේ කර්මාන්තයේ ඵලදාව වැඩි කරගන්නා තරසාර ක්‍රම පිළිබදවයි. “දුම්කොළ හා තේ කර්මාන්තයන් සංවිධානාත්මක ලෙස ක්‍රියාත්මක වන නිසා ඔවුන් හරහා අළුත් අදහස් අත්හදා බලන්නට හා හ`දුන්වා දෙන්නට වඩාත් ලෙහෙසියි” ඔහු පැහැදිලි කළා. එහෙත් එතැනින් පටන් ගත් SALT ක්‍රමවේදය ටිකෙන් ටික කදුකර ප්‍රදේශවල ගොවිතැන් කරන හැම දෙනාට ම ව්‍යාප්ත කිරීමේ වැදගත්කම ඔහු පෙන්වා දුන්නා. වල්පැළෑටි පාලනයට වල්නාශක යොදා ගත හැකි වූවත් එවිට විෂ රසායන ගොවිබිමට හා අවට පරිසරයට එකතු වන නිසා එය හිතකර ක්‍රමයක් නොවෙයි. වී ගොවිතැනේදී අපේ ගොවීන් වෙල්යායවල වතුර බදින්නේ වැඩිපුර ම වැඩිපුරම වල් පැළෑටි ගිල්වා මරා දැමීමට බවත්, වී ශාකයේ භෞතික අවශ්‍යතාවයන්ට එතරම් ජල ප්‍රමාණයක් උවමනා නැති බවත් ඔහු තේරුම් ගත්තා. ඔහුගේ ගණනය කිරීමට අනුව වී කිලෝග්‍රෑම් 1ක් නිපදවන්නට ජලය ටොන් 20ක් යෙදවීමේ අනුපාතයක් ලංකාවේ සමහර ප්‍රදේශවල තිඛෙනවා. ගොවීන්ට නොමිළයේ ලැඛෙන අහස් (වැසි) දිය හෝ වාරි ජලය මේ තරම් අධික ලෙස වී ගොවිතැනට යෙදීම දිගට ම කර ගෙන යා නොහැකි බවට 1990 දශකය මුලදී ඔහු අනතුරු ඇගවූවා. 21 වන සියවසේ මතුවන ජල හිගය ගැන කල් තබා දුටු ඔහු, ජලය මෙතරම් විශාල ප්‍රමාණයක් යොදා නොගෙන එම වී අස්වැන්න ම ලබා ගැනීමේ ක්‍රමවේදයන් ප්‍රචලිත කිරීමේ වැදගත්කම අවධාරණය කළා. වී වගාවේ SRI ක්‍රමය පෙන්වා දෙන්නේත් වඩා අඩු ජලයක් භාවිතා කරමින් ගොවිතැන් කළ හැකි බවයි. වෙල් යායට වතුර බ`දිනවා වෙනුවට කොළ රොඩු වැස්මක් ලබා දීමෙන් ඉතා අඩු වියදමකින් හා පරිශ්‍රමයකින් කුඹුරේ වල් පැළ මර්දනය වන බව රේ සොයාගත්තේ SRI ක්‍රමය ප්‍රචලිත වන්නට කලින්. “ලංකාව සැබැවින් ම වාසනාවන්ත දිවයිනක්. වසර පුරා අපට හිරුඑළිය ලැඛෙනවා. සරු පසක් හා යහපත් දේශගුණයක් තිඛෙනවා. අපට අවශ්‍ය ආහාර බෝග සියල්ලත්, අපේ බලශක්ති අවශ්‍යතාවයෙන් කොටසකුත් අපේ පොළවෙන් ම වවා ගත හැකියි.” මේ රේ විෙජ්වර්ධන නිතර කළ ප්‍රකාශයක්. එය කෙසේ කළ යුතු ද, කළ හැකි ද යන්න ඔහු ප්‍රායෝගිකව පෙන්වා දුන්නා. දැන් අපට තිඛෙන්නේ රේ සොයා දුන් මාවතෙහි නොබියව හා කඩිනමින් ගමන් කිරීමයි. I’ve been travelling for 25 years, but never once experienced an earthquake. Oh, I regularly visit places located in highly seismically active zones: Japan, Indonesia and Nepal among them. However, I’ve never been in the right place at the right time — or should it be ‘the wrong place at the wrong time’? That was finally corrected with the US East Coast earthquake on 23 August,the last day of my visit to Washington DC, where I’d been staying with a friend in Alexandria, Virginia. Daughter Dhara and I had just finished packing for our long return journey and making ourselves some lunch. Our friends were at work; we were alone with another visitor. Around 2 pm, and without any warning, the whole house started shaking. The basement made the biggest noise and a cupboard full of glassware next to the dining table rattled quite hard – for a moment I thought it was going to crash forward. Things settled down soon enough, and no further tremours were felt. After a few minutes, we went back inside. But I was puzzled: the US East Coast is not known to be seismically that active. 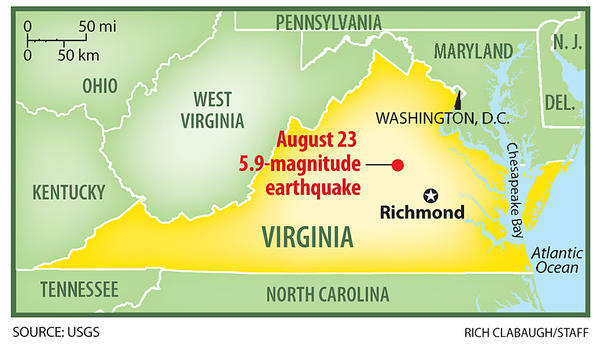 Yet a few minutes later the US Geological Survey, which monitors earthquakes worldwide, posted an update: this was indeed a magnitude 5.8 quake which was centred in the state of Virginia — the epicentre was only around 50km from where we are at the time. The largest previous earthquake (magnitude 4.8) in this area had occurred in 1875. Smaller earthquakes that cause little or no damage are felt each year or two. What I didn’t express, until now, is the sense of relief that as quakes go, this was a relatively harmless tremour! As news started coming in, we heard that the impact had been felt more forcefully in nearby towns and neighbourhoods. Government and corporate offices – including the US Congress and Pentagon (Defence Dept) — evacuated as a precautionary measure. Many shopping malls and other public places closed up in a hurry. The cell phone networks were clogged with too many people calling each other. It was a mild form of panic, something the Californians on the West Coast — so accustomed to tremours in their lives — found amusing. The US media — perhaps starved of breaking news in the lazy days of Summer — went into overdrive with saturation coverage. Much of it was cacophonous, but some outlets were more informed and measured. 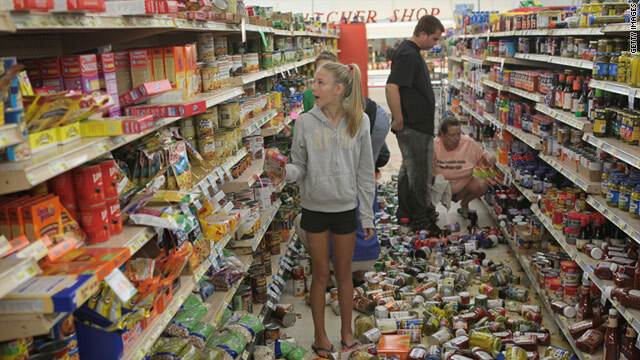 She added: “Since earthquakes are infrequent in this region, most people don’t know earthquake preparedness measures. Instead of running out of buildings, they should have dropped, covered and held on. Earthquakes are natural phenomena that become disasters when we don’t prepare adequately — or are not educated in proper measures. She also cited the exception to that norm: the British school girl Tilly Smith who was vacationing on a Thai beach that day and recognised the tell-tale signs of the oncoming tsunami. In the wake of the Virginia quake, my Oct 2007 blog post about Tilly has attracted considerable attention. Ray Wijewardene website: Celebrating a Man for All Elements! One year has passed since Ray Wijewardene’s death aged 86. In that year, I’ve been privileged to play a part in celebrating his life and preserving his legacy. Philip Revatha (Ray) Wijewardene (1924 – 2010) was an extraordinary Sri Lankan who was rightly called a Renaissance Man. Educated at two of the most prestigious universities in the world (Cambridge and Harvard), he excelled in many different areas of human endeavour: agriculture, aviation, engineering design, inventions, renewable energy technologies and water sports. He also painted and played the violin. The Ray Wijewardene official website went ‘live’ just in time for Ray’s 87th birth anniversary on 20 August 2011. 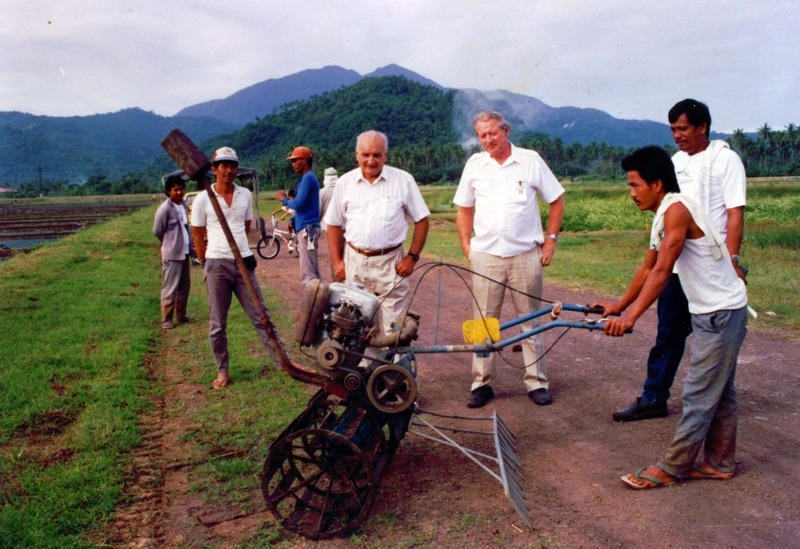 This informative website captures highlights of Ray’s rich and colourful life that covered different areas of human endeavour: agriculture, aviation, engineering design, renewable energy, transport and water sports. It promotes his vision for self-reliance, innovation and sustainable development in Sri Lanka and in other countries in the humid tropics. The website introduces Ray as ‘a man for all elements’, and showcases his personal logo that symbolised the integration of the four elements in eastern philosophy: water, fire, air and matter/Earth. It carries first person narratives written by five individuals who knew Ray in different capacities: aviator Capt Elmo Jayawardena, renewable energy specialist P G Joseph, science writer Nalaka Gunawardene, conservationist Dr Ranjith Mahindapala and biologist Rohan Pethiyagoda. It also collates links to tributes and appreciations that were published in the media following Ray’s death in August 2010. In another section, the website has a photo gallery that includes many hitherto-unseen images drawn from the Wijewardene family albums and from various other institutional and media sources. These offer glimpses of Ray Wijewardene’s education, training, career and leisure activities that took him to the universities of Cambridge and Harvard, international service with the United Nations, the Olympic and Asian games and the grassroots in Sri Lanka. The website was conceived and built by the Colombo-based non-profit media foundation TVE Asia Pacific. It is an entirely voluntary effort that involved the collaboration of many individuals from different backgrounds and geographical locations. Information and images were sourced from Ray’s family members, friends and associates. More information, photographs and videos are to be added as new material becomes available. The website actively seeks memories, anecdotes and images for the Ray biography compilation project that is now underway. In this Ravaya column (in Sinhala), I summarise the views of late Dr Ray Wijewardene on sustainable farming. Written to mark his first death anniversary, it is the beginning of a series of explorations of his critical thinking on issues of agriculture, energy, environmental conservation and innovation. This first appeared in Ravaya Sunday broadsheet newspaper on 21 August 2011. ආචාර්ය රේ විජේවර්ධන තමන් හමු වන්නට ආ අමුත්තන්ගෙන් නිතර මේ ප‍්‍රශ්නය ඇසුවා. බොහෝ දෙනකුගේ උත්තරය වූයේ මෝටර් රථයකින් හෝ බස් රථයකින් පැමිණි බවයි. මේ ප‍්‍රශ්නය දුසිම් ගණනක් දෙනා සමග රේ විජේවර්ධන මතු කරන්නට ඇති. ඒ තරමට ඔහු එබඳු දේ ගැන දිවා රාත‍්‍රී කල්පනා කළා. හැකි සෑම අවස්ථාවක ම රටේ විද්වතුන්, පාලකයන් හා ව්‍යාපාරිකයන්ගේ අවධානය යොමු කළා. ඉංග‍්‍රීසියෙන් නිදහසට කියන ‘independent’ යන වචනයට වඩා ඔහු කැමති වූයේ ‘non-dependent’ යන්නටයි. අපේ මූලික අවශ්‍යතා හැකි තාක් දුරට අප ම සම්පාදනය කර ගැනීමෙන් පමණක් අපේ රටට සැබෑ නිදහසක් හා ස්වාධීපත්‍යයක් ලද හැකි බව ඔහු තරයේ විශ්වාස කළා. විද්‍යා ජ්‍යොති, දේශමාන්‍ය ආචාර්ය පිලිප් රේවත (රේ) විජේවර්ධන අපෙන් වියෝ වී වසරක් පිරෙන මේ මොහොතේ ඔහුගේ අදීන චින්තනය ගැන ටිකක් කථා කරමු. ඉංජිනේරුවකු හැටියට බි‍්‍රතාන්‍යයේ කේම්බි‍්‍රජ් සරසවියේ ඉගෙනුම ලැබූවත් ඔහු පසු කලෙක තමන් හදුන්වා දුන්නේ ‘ගොවියකු හා කාර්මිකයකු’ හැටියටයි (farmer and mechanic). පොතේ දැනුම හා න්‍යායයන්ට වඩා ප‍්‍රායෝගික අත්දැකීම් හා අත්හදා බැලීමෙන් ලබා ගන්නා අවබෝධය ඉතා වටිනා බව ඔහු නිතර ම කියා සිටියා. බටහිර සම්ප‍්‍රදායට විද්‍යා අධ්‍යාපනයක් හා තාක්‍ෂණ පුහුණුවක් ලද ඔහු, පසු කලෙක තම උත්සාහයෙන් පෙරදිගට හා ශ්‍රී ලංකාවට උරුම වූ දේශීය දැනුම ප‍්‍රගුණ කළා. එහෙත් ඇතැම් අන්තවාදීන් මෙන් එක් දැනුම් සම්ප‍්‍රදායක එල්බ ගෙන අනෙක් සියළු දැනුම් සම්ප‍්‍රදායන් හෙළා දැකීමක් කළේ නැහැ. ඒ වෙනුවට ඔහු පෙර-අපර දෙදිග යා කරමින්, හැම තැනින් ම හරවත් හා ප‍්‍රයෝජනවත් දැනුම උකහා ගනිමින් අපේ කාලයේ සංවර්ධන අභියෝගයන්ට ප‍්‍රතිචාර දැක්විය හැකි ක‍්‍රමෝපායයන් සොයා ගියා. කෘෂිකර්මය, බලශක්තිය, ඉඩම් පරිහරණය හා පරිසර සංරක්‍ෂණය යන ක්‍ෂෙත‍්‍ර හතරේ නිරවුල් හා නිවහල් දැක්මක් මත පදනම් වූ ප‍්‍රායෝගික ප‍්‍රතිපත්ති, කි‍්‍රයාමාර්ග හා විසඳුම් රාශියක් ඔහු යෝජනා කළා. රේ විජේවර්ධනට කළ හැකි ලොකු ම ගෞරවය නම් ඔහු එසේ දායාද කළ දැනුම් හා අදහස් සම්භාරය ප‍්‍රයෝජනයට ගැනීමයි. හේන් ගොවියාට හා වෙල් ගොවියාට බලපාන ගැටළු හා අභියෝග හඳුනා ගන්නට ඔහු ඔවුන් සමග ගොවි බිම් හා වෙල්යායවල කල් ගත කළා. මුළු ජීවිත කාලය පුරා ම කෘෂිකර්මය පිළිබඳ ඔහුගේ දැක්මට පාදක වුණේ කුඩා ගොවියාගේ ජීවන තත්ත්වය නගා සිටුවීම හා ගොවිතැනේදී කුඩා පරිමාන ගොවීන් හා ගෙවිලියන්ගේ පරිශ‍්‍රමය වඩාත් කාර්යක්‍ෂම කිරීමයි. හරිත විප්ලවය (Green Revolution) 1950 දශකයේ ආරම්භ වන අවධියේ තරුණ විද්‍යාඥයකු හා ඉංජිනේරුවකු හැටියට රේ විජේවර්ධනත් එහි කොටස්කරුවකු වුණා. ඝර්ම කලාපීය රටවල කුඩා ගොවීන්ට ලෙහෙසියෙන් හැසිරවිය හැකි, නඩත්තුව වඩාත් පහසු වූ රෝද දෙකේ අත් ට‍්‍රැක්ටරයක් ඔහු නිර්මාණය කළා. බි‍්‍රතාන්‍යයේ සමාගමක් මගින් LandMaster නමින් 1960 හා 1970 දශකවල ලොව පුරා අලෙවි කළේ මේ නිර්මාණයයි. 20 වන සියවසේ තාක්‍ෂණ කේෂත‍්‍රයේ දැවැන්තයකු මතු කළ මේ සරල ප‍්‍රශ්නය හමුවේ තමන් නිරුත්තර වූ බවත්, ඒ ඔස්සේ දිගට කල්පනා හා සංවාද කිරීමෙන් පසු කෘෂිකර්මය පිළිබඳ එතෙක් තිබූ ආකල්ප මුළුමනින් ම වෙනස් කරගත් බවත් රේ පසුව ඉතා නිහතමානීව ප‍්‍රකාශ කළා. එම තීරණාත්මක මුණ ගැසීමෙන් අනතුරුව බක්මින්ස්ටර් ෆුලර් හා රේ විජේවර්ධන සමස්ත හරිත විප්ලවය විචාරශීලීව විග‍්‍රහ කළා. රේ එතැන් පටන් සිය ජීවිත කාලය ම කැප කළේ සොබා දහමට වඩාත් සමීප වන ගොවිතැන් කිරීමේ ක‍්‍රම ප‍්‍රගුණ කරන්නට හා ප‍්‍රචලිත කරන්නටයි. පරිසරයට හිතකර ගොවිතැන (conservation faming) අපට අළුත් දෙයක් නොවන බව ඔහු පෙන්වා දුන්නා. අද මේ කරුණු බොහෝ දෙනා පිළි ගෙන ඇතත් 1960 දශකය අගදී රේ මෙබඳු අදහස් ප‍්‍රසිද්ධියේ ප‍්‍රකාශ කළ විට ඒවා මනෝ විකාර හා සංවර්ධන-විරෝධී, කඩාකප්පල්කාරී අදහස් හැටියට සැළකුණා. බතින් බුලතින් රට ස්වයංපෝෂණය කිරීමේ ඒකායන ඉලක්කයට කොටු වී සිටි දේශපාලකයන්ට හා නිලධාරීන්ට මේ අදහස්වල වටිනාකම වැටහුනේ බොහෝ කලක් ගත වූ පසුවයි. ප‍්‍රශ්නයක් මතු කළ හැම විට ම එයට හොඳ විසඳුම් සොයා යාමේ මාහැගි පුරුද්දක් රේට තිබුණා. හරිත විප්ලවය බලාපොරොත්තු වූ තරම් දිගු කාලීන වාසි ලබා නොදුන් නිසා එයට විකල්ප සෙවීම අවශ්‍ය වුණා. එහිදී ඔහු නවීන විද්‍යා දැනුම ප‍්‍රතික්‍ෂෙප කළේ නැහැ. දෙවන ලෝක යුද්ධයේ නිමාවෙන් පසු ලොව පුරා සීඝ‍්‍රයෙන් වර්ධනය වූ ජනගහනයට සරිලන තරමට ආහාර නිෂ්පාදනය වැඩි කිරීමේ ප‍්‍රායෝගික අවශ්‍යතාවය ඔහු හොඳ හැටි දුටුවා. ඔහු කියා සිටියේ පෙරදිග අපේ වැනි රටවල දිගු කලක් තිස්සේ ගොවිතැන් සඳහා යොදා ගත් දේශීය දැනුම කාලීන අවශ්‍යතාවයන්ට අනුව සකසා ගැනීමෙන් වඩාත් කාර්යක්‍ෂම, පරිසරයට මෙන් ම අපේ සෞඛ්‍යයටද හිතකර ආහාර බෝග නිෂ්පාදනයකට යොමු විය හැකි බවයි. මෙය හඳුන් වන්නේ low external input sustainable agriculture (LEISA) කියායි. මා රේ විජේවර්ධන හඳුනා ගත්තේ 1980 දශකය මැද දී. ඔහු ඉතා නිහතමානී ලෙසින් හා උද්‍යොගයෙන් තරුණ විද්‍යා ලේඛකයකු හා පුවත්පත් කලාවේදීයකු වූ මගේ ප‍්‍රශ්නවලට පිළිතුරු දුන්නා. ඔහුගේ විෂය ක්‍ෂෙත‍්‍රයන්ට අදාල කරුණක් ගැන අසා දැන ගැනීමට ඕනෑ ම වේලාවක දුරකථනයෙන් හෝ මුණගැසී හෝ කථාකිරීමේ අවකාශය ඔහු ලබා දුන්නා. ඒ බොහෝ අවස්ථාවල ඔහුගේ ඉල්ලීම වූයේ ඔහුගේ නම සඳහන් නොකර නව අදහස් හා තොරතුරු මගේ පාඨකයන්ට බෙදා දෙන ලෙසයි. විශ්වාසනීයත්වය වඩාත් තහවුරුවන්නේ ඒවා මූලාශ‍්‍ර සමග ම ප‍්‍රකාශයට පත් කිරීම බව මා පහදා දුන් විට ඔහු එය පිළි ගත්තා. නමුත් සමහර විද්වතුන් මෙන් ඔහු කිසි දිනෙක මාධ්‍ය ප‍්‍රසිද්ධිය සොයා ගියේ නැහැ. මේ රටේ බොහෝ දෙනකු රේ විජේවර්ධනගේ හපන්කම් හා චින්තනය ගැන නොදන්නේ ඒ නිසා විය හැකියි. 1995 මැද දී ඉන්දියාවේ මුල් පෙළේ විද්‍යා ලේඛකයකු හා පරිසර චින්තකයකු වූ අනිල් අගර්වාල් (Anil Agarwal) මගෙන් සුවිශේෂී ඉල්ලීමක් කළා. ඔහුගේ සංස්කාරකත්වයෙන් පළ කරන Down to Earth විද්‍යා හා පරිසර සඟරාව සඳහා රේ සමග සම්මුඛ සාකච්ජාවක් කරන ලෙසට.”රේ කියන්නේ දියුණුවන ලෝකයේ සිටින අංක එකේ කෘෂි හා ශෂ්‍ය විද්‍යා විශේෂඥයකු පමණක් නොවෙයි, අපට සිටින ඉතාම ස්වාධීන හා නිර්මාණශීලී චින්තකයෙක්” අනිල් මට කියා සිටියා. අනිල්ගේ ඉල්ලීම පරිදි මා රේ සමග දීර්ඝ සම්මුඛ සාකච්ඡුාවක් පටිගත කළා. එයට වරු දෙක තුනක් ගත වූ බවත්, එහි තොරතුරු සම්පූර්ණ කරන්නට තව දින ගණනාවක් වෙහෙස වූ සැටිත් මට මතකයි. එහි සාරාංශයක් Down to Earth සඟරාවේ 1995 ඔක්තෝබර් 31 කලාපයේ පළ වුණා. වී ගොවිතැන, හේන් ගොවිතැන, හරිත විප්ලවය හා එහි අහිතකර ප‍්‍රතිඵල, බලශක්ති අර්බුදයට දේශීය පිළියම් ආදී තේමා රැසක් ගැන අප කථා කළා. රේ විජේවර්ධන චින්තනය පිළිබඳ නව වෙබ් අඩවියක් ද මේ සතියේ එළි දකිනවා. South Asia’s notorious killing fields, a.k.a. roads, have robbed us of another highly talented and committed professional. Bangladesh film maker Tareque Masud died on the spot when his microbus collided head-on with a passenger bus in in Ghior, close to Dhaka, on August 13. The accident also killed Mishuk Munier, CEO of Bangladesh’s private ATN television news channel and three others, and injured Tareque’s film maker wife Catherine. The Masuds and team had been returning after scouting for locations for their next feature film, named Kagojer Ful (The Paper Flower). It was to be a prequel to his award-winning first full-length feature film, Matir Moina (English release title “The Clay Bird”). Matir Moina was received with critical praise and toured the international circuit. However, the Bangladeshi Government initially refused to issue a censor certificate for national screening, saying it gave a distorted image of the madrasa system, and that it could hurt feelings in this Muslim-dominated country. Confronted by Tareque’s appeal and widespread international pressure, the decision was later reversed. 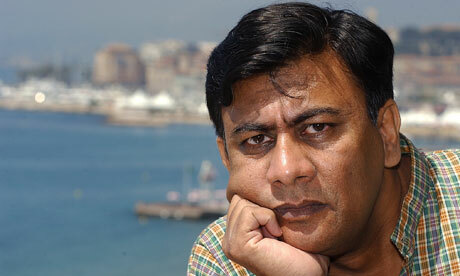 Matir Moina later became the first entry from Bangladesh in the best foreign language film category at the Oscar awards. Tareque made several documentaries before venturing into feature film making. I first came to know his work through Muktir Gaan (The Song of Freedom, 78 mins, 1995), the most famous film in early age of his career. In that documentary, the camera follows a music troupe during the Liberation War of Bangladesh in 1971. The members of the troupe sing songs to inspire freedom fighters. The film was made mainly based on the footage of American filmmaker Lear Levin that Masud got from the basement of Levin’s house in New York. Muktir Gaan was an extraordinarily compelling film that was released theatrically in Bangladesh, blazing a new trail in distributing long-format documentaries in South Asia. It was also a strong entry at the inaugural edition of Film South Asia festival in Kathmandu, where I was on the jury. We awarded it a Jury Special Mention. The Masuds followed it up with Muktir Kotha (The Story of Freedom, 82 mins, 1996), an oral history documentary about the experience of ordinary villagers during 1971 Liberation War. They also made many development related films through their Dhaka based production company, AudioVision. I have fond memories of meeting Tareque and Catherine at the FSA festival. Our paths crossed at least a couple of times more in different corners of South Asia. Although we once discussed a collaborative project, it never happened due to the lack of funding. 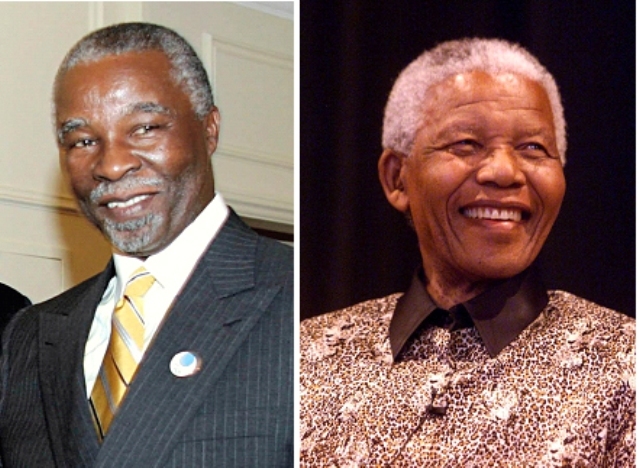 In my Ravaya column (in Sinhala) for 31 July 2011, I look back at South Africa’s HIV/AIDS misadventure under President Thabo Mbeki, who refused to accept the well-established scientific consensus about the viral cause of AIDS and the essential role of antiretroviral drugs in treating it. 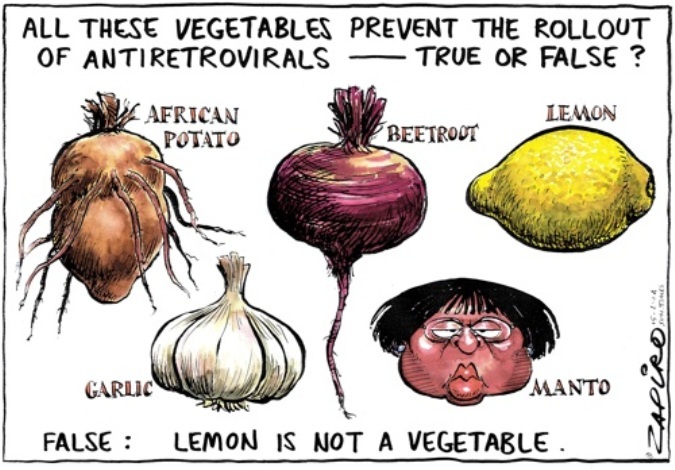 Instead, he and his health minister embarked on a highly dubious treatment using garlic, lemon juice and beetroot as AIDS remedies — all in the name of ‘traditional knowledge’. It turned out to be a deadly experiment, and one of the worst policy debacles in the history of public health anywhere in the world. In 2008, A study by Harvard researchers estimated that the South African government could have prevented the premature deaths of 365,000 people if it had provided antiretroviral drugs to AIDS patients and widely administered drugs to help prevent pregnant women from infecting their babies. There are lessons for all governments addressing complex, technical issues: do not allow a vocal minority to hijack the policy agenda, ignoring well established science and disallowing public debate on vital issues. AIDS රෝගය මුලින් ම වාර්තා වී වසර තිහක් ගත වී තිබෙනවා. අමෙරිකාවේ මුල් වරට මේ රෝග ලක්ෂණ සහිතව රෝගීන් වාර්තා වන්නට පටන් ගත්තේ 1981දී. එයට හේතුව HIV නම් වයිරසය බව සොයා ගත්තේ ඊට දෙවසරකට පසුව. අද HIV/AIDS ලෝක ව්‍යාප්ත වසංගතයක් හා ලෝකයේ ප්‍රධාන පෙළේ සංවර්ධන අභියෝගයක් බවට පත්ව තිබෙනවා. අළුත් ම සංඛ්‍යා ලේඛනවලට අනුව 2009 වන විට HIV ශරීරගත වී ජීවත්වන සංඛ්‍යාව මිලියන් 33ක්. අළුතෙන් ආසාදනය වන සංඛ්‍යාව වසරකට මිලියන් 2.6ක්. HIV ආසාදන උත්සන්න අවස්ථාවේ AIDS රෝගය ඇති වී මිය යන සංඛ්‍යාව වසරකට මිලියන් 2ට වැඩියි. HIV/AIDS ගැන විවිධ කෝණවලින් විග්‍රහ කළ හැකියි. දුගී දුප්පත්කම, බලශක්ති අර්බුද, පරිසර දූෂණය හා ගැටුම්කාරී තත්ත්වයන්ට මුහුණ දෙන දියුණුවන ලෝකයේ බොහෝ රටවලට ගෙවී ගිය දශක තුන තුළ HIV/AIDS නම් අමතර අභියෝගයට ද මුහුණ දීමට සිදු වුණා. එයින් දැඩි සේ පීඩාවට පත් දකුණු අප්‍රිකාවේ HIV/AIDS ප්‍රතිපත්තිය වසර ගණනක් අයාලේ ගිය කථාවයි අද විග්‍රහ කරන්නේ. මෑතදී මා නැවතත් දකුණු අප්‍රිකාවට ගිය අවස්ථාවේ මගේ දැනුම අළුත් කර ගන්නට ලැබුණු නිසායි. ලෝකයේ වැඩි ම HIV ආසාදිත ජන සංඛ්‍යාවක් සිටින රට දකුණු අප්‍රිකාවයි. 2007 දී HIV සමග ජීවත් වන දකුණු අප්‍රිකානුවන් සංඛ්‍යාව මිලියන් 5.7 ක් පමණ වුණා. එනම් මුළු ජනගහනය මිලියන් 48න් සියයට 12ක්. එය එරට සෞඛ්‍ය අර්බුදයක් පමණක් නොව සමාජයීය හා ආර්ථීක ප්‍රශ්නයක් ද වෙනවා. ජනාධිපති නෙල්සන් මැන්ඩෙලාගේ 1994-99 ධූර කාලයේ HIV/AIDS පිළිබඳව දකුණු අප්‍රිකාවේ සෞඛ්‍ය ප්‍රතිපත්ති සකස් වූයේ ලොව පිළිගත් වෛද්‍ය දැනුම හා උපදෙස් මතයි. HIV සමග ජීවත් වන අයට හැකි තාක් කල් නීරෝගීව දිවි ගෙවන්නට ඖෂධ සපයන අතරේ වයිරසය පැතිරයාම වැළැක්වීමේ දැනුවත් කිරීම් හා මහජන අධ්‍යාපන ව්‍යාපාරයක් දියත් වුණා. එහෙත් ඔහුගෙන් පසු ජනාධිපති වූ තාබෝ එම්බෙකි (Thabo Mbeki) මේ ගැන ප්‍රධාන ප්‍රවාහයේ වෛද්‍ය විද්‍යාත්මක දැනුම ප්‍රශ්න කරන්නට පටන් ගත්තා. වෛද්‍ය විශේෂඥ දැනුමක් නොතිබුණත් තියුණු බුද්ධියකින් හෙබි එම්බෙකි, මෙසේ අසම්මත ලෙස සිතන්නට යොමු වුණේ HIV/AIDS ගැන විකල්ප මතයක් දරන ටික දෙනකුගේ බලපෑමට නතු වීම නිසයි. මේ අයට ඉංග්‍රීසියෙන් AIDS Denialists කියනවා. ඔවුන්ගේ තර්කය AIDS රෝගය හට ගන්නේ HIV වයිරසය නිසා නොව දුප්පත්කම, මන්ද පෝෂණය වැනි සමාජ ආර්ථීක සාධක ගණනාවක ප්‍රතිඵලයක් ලෙසින් බවයි. එම්බෙකිගේ සෞඛ්‍ය ඇමතිනිය (1999-2008) ලෙස ක්‍රියා කළ මාන්ටෝ ෂබලාලා සිමැංග් (Manto Tshabalala Msimang) මේ අවුල තවත් ව්‍යාකූල කළා. HIV ආසාදනය පාලනය කරන බටහිර වෛද්‍ය විද්‍යාවේ ඖෂධ වෙනුවට සම්ප්‍රදායික අප්‍රිකානු දැනුමට අනුව සුදුළුෑනු, දෙහි සහ බීට්රූට් යුෂ ගැනීම සෑහෙන බවට ඇය ප්‍රසිද්ධියේ ප්‍රකාශ කළා! මේ නිසා HIV වයිරසයට ප්‍රහාර එල්ල කිරීම වෙනුවට දුප්පත්කම පිටුදැකීම කළ යුතු යයි ස්ථාවරයකට එම්බෙකි යොමු වුණා. HIV මර්දන සෞඛ්‍ය කටයුතු අඩපණ කරන්නටත්, මහජන සෞඛ්‍ය සේවා හරහා ඖෂධ ලබා දීම නතර කිරීමටත් එම්බෙකි රජය පියවර ගත්තා. HIV සමග ජීවත්වන බහුතරයක් දකුණු අප්‍රිකානුවන්ට AIDS රෝග ලක්ෂණ පහළ වී නැහැ. HIV ශරීරගත වීමෙන් පසු වසර හෝ දශක ගණනක් ජීවත්වීමේ හැකියාව අද වන විට වෛද්‍ය විද්‍යාත්මකව ලබා ගෙන තිබෙනවා. එහෙත් ඒ සඳහා නිතිපතා Anti-Retroviral (ARV) ඖෂධ ගැනීම අවශ්‍යයි. බොහෝ දියුණු වන රටවල අඩු ආදායම් ලබන HIV ආසාදිතයන්ට මේ ඖෂධ ලබා දෙන්නේ රජයේ වියදමින්. HIV ආසාදිත කාන්තාවන්ට ARV ඖෂධ නිසි කලට ලැබුණොත් ඔවුන් බිහි කරන දරුවන්ට මවගෙන් HIV පැතිරීම වළක්වා ගත හැකියි. එහෙත් එම්බෙකි රජය HIV වයිරසය ගැන විශ්වාස නොකළ නිසා ප්‍රජනන වියේ සිටින HIV ආසාදිත කාන්තාවන්ට එම ඖෂධ දීමත් නතර කළා. දකුණු අප්‍රිකාව ජාතීන්, භාෂා හා දේශපාලන පක්ෂ රැසක සම්මිශ්‍රණයක්. එමෙන් ම 1994 සිට නීතියේ ආධිපත්‍යය හා රාජ්‍යයේ බල තුලනය පවතින රටක්. ප්‍රජාතන්ත්‍රවාදී සම්ප්‍රදායයන් හා ආයතන ප්‍රබල කරන්නට සැබෑ උත්සාහ ගන්නා රටක්. මෙබඳු රටක වුවත් වසර කිහිපයක් පුරා ජනාධිපතිවරයාට හා සෞඛ්‍ය ඇමතිනියට මෙබඳු ප්‍රබල ප්‍රශ්නයකදී මේ තරම් අයාලේ යන්නට ඉඩ ලැබුණේ කෙලෙසදැයි මා එරට විද්‍යාඥයන් හා මාධ්‍යවේදීන් කිහිප දෙනකුගෙන් ඇසුවා. ඔවුන් දුන් පිළිතුරුවල සම්පිණ්ඩනය මෙයයි. තාබෝ එම්බෙකි යනු වර්ණභේදවාදයට එරෙහිව දශක ගණනක් අරගලයක යෙදුණු, පාලක ANC පක්ෂයේ ප්‍රබල චරිතයක්. ඔහුගේ දේශපාලන කැපවීම පිළිබඳව විවාදයක් නැහැ. මැන්ඩෙලා 1994දී ජනාධිපති වන විට එම්බෙකි උප ජනාධිපති වුණා. 1994-99 කාලය තුළ එරට ආර්ථීක වර්ධනයට හා සමාජ සංවර්ධනයට නායකත්වය සැපයූ ඔහු අප්‍රිකානු කලාපයේ දක්ෂ රාජ්‍ය තාන්ත්‍රිකයකු ලෙස නමක් දිනා ගත්තා. මැන්ඩෙලා එක් ධූර කාලයකින් පසු කැමැත්තෙන් විශ්‍රාම ගිය විට එම්බෙකි ANC ජනාධිපති අපේක්ෂකයා වී ජයග්‍රහණය කළා. පරිණත දේශපාලකයකු රටේ ජනාධිපති ලෙස මහජන ඡන්දයෙන් තේරී පත්ව සිටින විටෙක, වැරදි උපදෙස් නිසා එක් වැදගත් ප්‍රශ්නයක් සම්බන්ධයෙන් ඔහු නොමග යාමට අභයෝග කරන්නේ කෙසේ ද? දකුණු අප්‍රිකාවේ වෛද්‍යවරුන් හා අනෙක් විද්වතුනට තිබූ ප්‍රශ්නය එයයි. සාම්ප්‍රදායික දැනුම එක එල්ලේ හෙළා නොදැක, එහි සීමාවන් ඇති බව පෙන්වා දෙමින්, රටේ නායකයා හා සෞඛ්‍ය ඇමති සමග හරවත් සංවාදයක යෙදෙන්නට සීරුවෙන් හා සංයමයෙන් කටයුතු කරන්නට ඔවුන්ට සිදු වුණා. ANC පක්ෂය තුළ ම එම්බෙකිගේ HIV/AIDS ස්ථාවරය ගැන ප්‍රශ්න මතු වුණා. එහෙත් මැන්ඩෙලා මෙන් විකල්ප අදහස් අගය කිරීමේ හැකියාවක් එම්බෙකිට නොතිබූ නිසාත්, ජනාධිපති හැටියට වඩා ඒකමතික පාලනයක් ඔහු ගෙන යන්නට උත්සාහ කළ නිසාත් පක්ෂය ඇතුළෙන් දැඩි ප්‍රතිරෝධයක් ආවේ නැහැ. 2002 දී පැවති ANC පක්ෂ රැස්වීමකදී මැන්ඩෙලා මේ ගැන සාවධානව අදහස් දැක් වූ විට එම්බෙකි හිතවාදියෝ ‘ජාතියේ පියා’ හැටියට අවිවාදයෙන් සැළකෙන මැන්ඩෙලාට වාචිකව ප්‍රහාර එල්ල කළා. එයින් පසු මැන්ඩෙලා ද තම අනුප්‍රාප්තිකයාගේ HIV/AIDS ප්‍රතිපත්ති ප්‍රසිද්ධියේ ප්‍රශ්න කිරීමෙන් වැළකුණා. එම්බෙකි හිතවාදියෝ එතැනින් නතර වුණේ නැහැ. සිය නායකයාගේ අසම්මත HIV/AIDS න්‍යායට එරෙහිව කථා කරන විද්‍යාඥයන් හා වෛද්‍යවරුන්ට මඩ ප්‍රහාර දියත් කළා. දකුණු අප්‍රිකාවේ සිටින ලොව පිළිගත් ප්‍රතිශක්තිවේදය පිළිබඳ විශේෂඥයකු වූ මහාචාර්ය මක්ගොබා (Prof Malegapura Makgoba) ජනාධිපතිගෙන් ඉල්ලා සිටියා ලොව හිනස්සන මේ න්‍යායෙන් අත් මිදෙන ලෙස. මේ මහාචාර්යවරයා බටහිර විද්‍යාවට ගැතිකම් කරන, අප්‍රිකාවේ සාම්ප්‍රදායික දැනුම හෙළා දකින්නකු ලෙස ජනාධිපති කාර්යාලය විසින් හදුන්වනු ලැබුවා. සුදු ජාතික හෝ ඉන්දියානු සම්භවය සහිත විද්වතකු ජනාධිපති මතවාද ගැන ප්‍රශ්න කළ විට එය ‘කළු ජාතික නායකයාට අවමන් කිරීමේ’ සරල තර්කයකට ලඝු කරනු ලැබුවා. මේ මඩ ප්‍රහාර හා රාජ්‍ය යාන්ත්‍රණයට එරෙහිව හඬක් නැගූ සුදු හා කළු ජාතික දකුණු අප්‍රිකානුවන් ටික දෙනකු ද සිටියා. ඔවුන් විද්‍යා ක්‍ෂෙත‍්‍රයෙන් පමණක් නොව සාහිත්‍ය, කලා සහ සාමයික ක්‍ෂෙත‍්‍රවලින් ද මතුව ආවා. එහිදී දැවැන්ත කාර්ය භාරයක් ඉටු කළේ කේප්ටවුන්හි ආච්බිෂොප් ඩෙස්මන්ඩ් ටූටූ. වර්ණභේදවාදයට, අසාධාරණයට හා දිළිඳුබවට එරෙහිව දශක ගණනක් තිස්සේ අරගල කරන, 1984 නොබෙල් සාම ත්‍යාග දිනූ ඔහු, මුළු ලෝකය ම පිළිගත් චරිතයක්. 1994න් පසු ඡන්දයෙන් බලයට පත් හැම රජයක ම හොඳ දේ අගය කරන අතර වැරදි ප්‍රතිපත්ති නොබියව විවේචනය කරන්නෙක්. ඩෙස්මන්ඩ් ටූටූ මුලදී පෞද්ගලිකවත් පසුව මහජන සභාවලත් එම්බෙකිගේ HIV/AIDS මංමුලාව ගැන කථා කළා. මහජන උන්නතියට ඍජුව ම බලපාන මෙබඳු ප්‍රශ්න සම්බන්ධයෙන් විවෘත සංවාදයක් පැවතිය යුතු බවත්, බහුතර විද්වත් මතයට ගරු කිරීම ප්‍රජාතන්ත්‍රවාදී රජයක වගකීම බවත් ඔහු අවධාරණය කළා. 1991 නොබෙල් සාහිත්‍ය ත්‍යාගය දිනූ සුදු ජාතික දකුණු අප්‍රිකානු ලේඛිකා නැඩීන් ගෝඩිමර් ද මේ සංවාදයට එක් වුණා. 2004 දී ඇය ප්‍රසිද්ධ ප්‍රකාශයක් කරමින් කීවේ ජනාධිපති එම්බෙකීගේ අනෙක් සියළු ප්‍රතිපත්ති තමා අනුමත කරන නමුත් HIV/AIDS ගැන ඔහුගේ ස්ථාවරය පිළි නොගන්නා බවයි. දකුණු අප්‍රිකාවේ ස්වාධීන ජනමාධ්‍ය ද ජනාධිපති හා ඇමතිනියන්ගේ HIV/AIDS මනෝ විකාර දිගට ම විවේචනය කළා. ඇමතිනියට Madam Beetroot හෙවත් ‘බීට්රූට් මැතිනිය’ යන විකට නාමය දෙනු ලැබුවා. එහෙත් මේ දෙපළ දිගු කලක් තම වැරදි මාර්ගයෙන් ඉවත් වූයේ නැහැ. විවේචකයන්ගේ දේශපාලන දැක්ම, ජාතිය හා සමේ වර්ණය අනුව යමින් මේවා හුදෙක් ‘විරුද්ධවාදීන්ගේ කඩාකප්පල්කාරී වැඩ’ ලෙස හඳුන්වා දුන්නා. 2002 වන විට ANC පක්ෂය තුළින්, රට තුළින් හා ජාත්‍යන්තර විද්වත් සමූහයා වෙතින් මතුව ආ ප්‍රබල ඉල්ලීම් හමුවේ ජනාධිපති එම්බෙකි එක් පියවරක් ආපස්සට ගත්තා. එනම් ආන්දෝලනයට තුඩු දුන් HIV/AIDS ප්‍රතිපත්ති ගැන මින් ඉදිරියට ප්‍රසිද්ධියේ කිසිවක් නොකීමට. ජනාධිපති මෙසේ මුනිවත රැක්කත් සෞඛ්‍ය ඇමතිනියගේ අයාලේ යාම තවත් කාලයක් සිදු වුණා. එහෙත් එරට HIV/AIDS ප්‍රතිපත්ති යළිත් ප්‍රධාන ප්‍රවාහයට පැමිණීම එම්බෙකිගේ ධූර කාලය හමාර වන තුරු ම හරිහැටි සිදුවුණේ නැහැ. 2008 සැප්තැම්බරයේ ඔහු තනතුරින් ඉල්ලා අස් වූ පසු කෙටි කලකට ජනාධිපති වූ කලේමා මොට්ලාතේ තනතුරේ මුල් දිනයේ ම එම්බෙකිගේ සෞඛ්‍ය ඇමතිනිය ඉවත් කළා. ඒ වෙනුවට HIV/AIDS සම්බන්ධයෙන් කාගේත් විශ්වාසය දිනාගත් බාබරා හෝගන් සෞඛ්‍ය ඇමති ලෙස පත් කළා. ඇය ප්‍රතිපත්ති හරි මගට ගන්නට හා ARV ප්‍රතිකාර ව්‍යාප්ති කරන්නට ඉක්මන් පියවර ගත්තා. මේ ජීවිත හානි වලට වගකිව යුත්තේ කවුද? දිවි සුරකින දැනුම සම්බන්ධයෙන් සෙල්ලම් කරන්නට යාමේ අවදානම හා එහි භයානක ප්‍රතිඵලවලට දකුණු අප්‍රිකාවේ HIV/AIDS මංමුලාව මතක හිටින පාඩමක්.